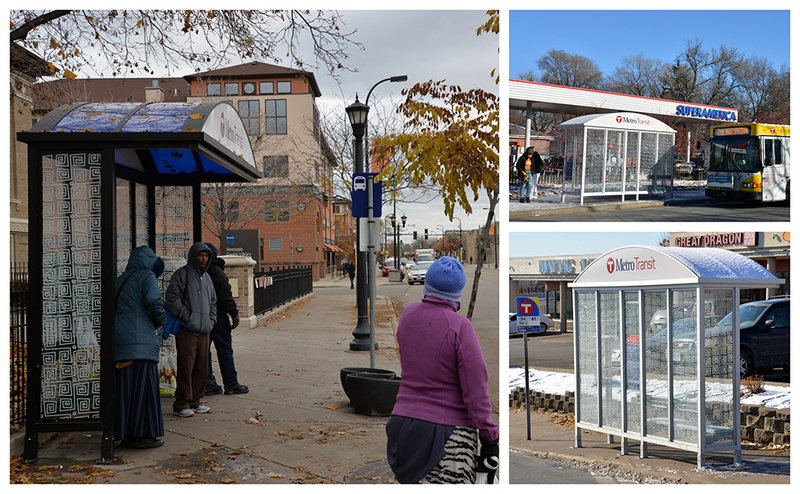 Several boarding locations were improved with new or existing shelters this year including, clockwise from left, a stop outside the Franklin Library on Franklin Avenue, Minneapolis; 7th Street East and Johnson Parkway, St. Paul, and Arcade Street and York Avenue, St. Paul. Until earlier this year, customers who boarded Route 63 buses at the corner of Third Street East and Maria Avenue, on St. Paul’s East Side, waited without protection from wind or rain. Now, they have a blue roof over their heads. The stop was one of around two-dozen locations where new waiting shelters were installed this year in an ongoing effort to create more inviting and comfortable bus stops. The Better Bus Stops program began in 2014 with a goal of bringing 150 new shelters to low-income neighborhoods where most residents are people of color. The program also sought to add heat, light, or both at 75 existing shelters. With the progress made this year, those goals are due to be achieved in 2019. Around 10 percent of the region’s 12,000 bus stops have a shelter. Nearly two-thirds of boardings occur at bus stops with shelters. “With help from our facilities team and many others, we’ve really made tremendous progress in just a few years,” said Berry Farrington, a senior planner who has helped lead the Better Bus Stops program. Adding and improving shelters has been just one of the benefits of the Better Bus Stops program. Feedback collected by community partners led Metro Transit to take another look at how shelter installations are prioritized. Along with the busiest bus stops, the guidelines say shelters should be considered at other key locations, including major transfer points, near hospitals and in areas where people are unlikely to own a vehicle. The updated shelter guidelines and the outreach work that informed them was celebrated earlier this year by Transit Center, a New York-based transit advocacy group. “Metro Transit proves that when a transit agency supports its bus stop program with a vision, a long-term plan, funding, and a committed and cooperative staff, it can quickly improve bus stops across the region,” the group said in a report on bus stop improvements. Metro Transit continues to find ways of installing shelters at challenging locations, too. To meet federal guidelines for historic areas, a shelter with a bronze frame was installed outside the library on Franklin Avenue. At Hennepin Avenue and Fifth Street, clear panes were used to provide better visibility – a safety feature. Shelters with less depth were installed at several sites with space constraints. In addition to this work, more than 30 advertising shelters were replaced this year in Minneapolis and St. Paul. Until Metro Transit took them over, the shelters had been privately owned and maintained. Customers who use schedules posted in waiting shelters will soon have an easier time telling when the next bus should arrive. Instead of using timepoints, shelter schedules printed for the December 1 service adjustments show the actual departure times. Timepoints are major stops or intersections along a route and are used to simplify printed schedules. Shelter schedules could confuse customers who thought the schedule referred to the time a bus was due to arrive at their stop, instead of the nearby timepoint it was referring to. Providing more accurate data will make an already-powerful tool even more useful, Transit Information Project Manager Laura Matson said. “Shelter schedules are a tool that most of our customers can use and understand, even if there’s a language barrier or they’re new to transit,” she said. The displays were also redesigned to include route maps and have a more professional look.